The Ocean Tunnel immersive artwork at Scripps Institution of Oceanography. A unique, immersive art installation at Scripps Institution of Oceanography seeks to dramatically illustrate the plight of the world’s oceans amid climate change. The 125-foot-long, 8-foot-tall “Ocean Tunnel” installation, which opens to the public Saturday, is filled with murals of marine life by national and international artists. Upon entering, visitors find themselves surrounded by a diverse, healthy ocean with large fish and a variety of species. As they progress, the diversity dwindles and the fish become smaller, reflecting changes caused by human pressure on the oceans. Visitors end in a very different ocean than where they began, surrounded only by jellyfish—a future projection that could become reality. The exhibit is the vision of Madeleine Hamann, a physical oceanography PhD student at Scripps, who was inspired to use an immersive art experience as a way to educate people about the changes occurring in the oceans. Hamann was inspired by her experiences at Burning Man, an arts and culture festival held annually in the Nevada desert. She partnered with San Diego Collaborative Arts Project and RouteUSA to develop the exhibit, which made its debut at Burning Man 2018. Artists Mark Dugally (Los Angeles), Dana Montlack (Florida), Taylor Reinhold (Santa Cruz), Phillipp Aurand (Seattle), Sierra Joy and her mother Lynn McGeever (Truckee), Isabel Halpern (San Diego) and Lux Nieve (Spain) contributed panels. 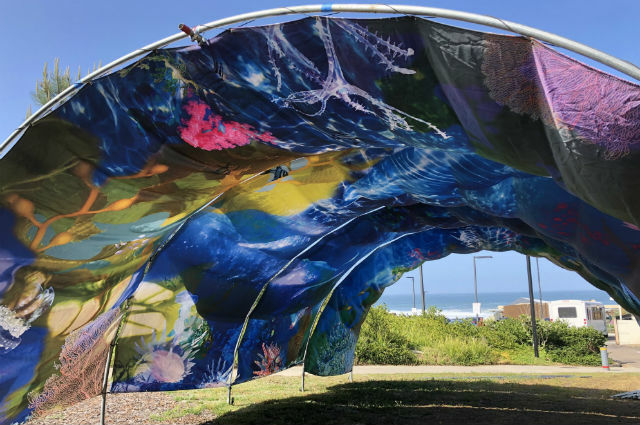 The installation is located on the south side of Sverdrup Hall, near the intersection of La Jolla Shores Drive and El Paseo Grande, and will remain open to the public until April 30.